As the beginning of a new year is often a time for fitness resolutions, consider checking out programs related to rider fitness. Some links to programs are below. And KCDS Member and sponsor, Deborah Johnson, teaches pilates. See the "Sponsors" page for contact information. Please check out the newsletter from Region 4 here for more information on all of the below. Region 4 will be hosting clinics for riders from ages 10-21 to learn about the NAJYRC process and prepare them for the riding and administrative requirements of competing at such levels. The first workshop will be January 20-21 Schmitt Horse Training Center in Somerset, Wisconsin and Nancy Gorton will be the instructor. The deadline for registration is January 13! The International Omaha 2018 horse show is offering the opportunity to ride with Olympic Gold Medalist Hubertus Schmidt in the Dressage Showcase on Friday, April 13. Riders at third level or above will ride in an hour and a half clinic-style format conducted by Schmidt before a live audience. Schmidt will work one-on-one with each rider for approximately 30 minutes. Applications are currently being accepted to ride in the Showcase from riders at third level or higher, who wish to participate at that level or on a young horse aged 5-6-7. 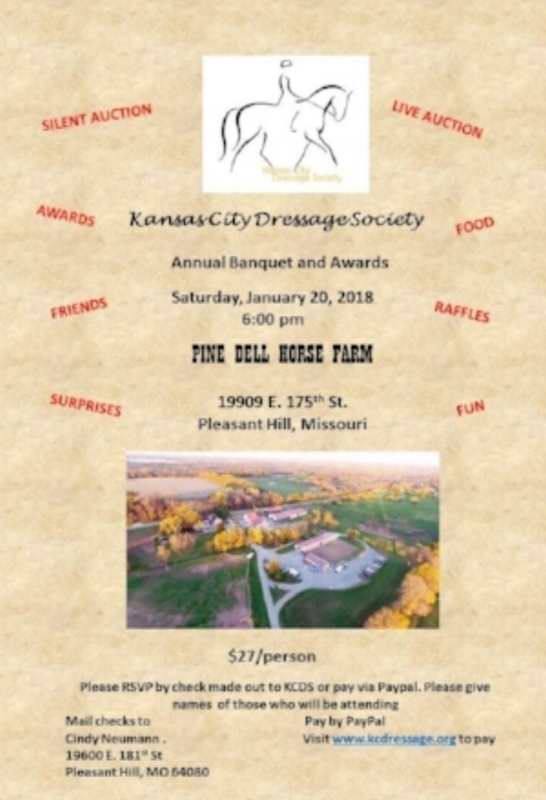 To RSVP and pay for the Banquet via PayPal, go to your PayPal account and send your payment to kcdsinfo@gmail.com, it will present as Kansas City Dressage Society, and please add a note that it is payment for the banquet. Or mail your check to Cindy Neuman 19600 E. 181st Street, Pleasant Hill, MO 64080. Email Cindy at cneumann857@gmail.com with any questions. Looking forward to seeing you there! Madison Peer has graciously volunteered to create a year-end retrospect of KCDS activities and fun. If you have pictures and/or video clips of you and your horse in action, candid shots, funny shots/videos, bloopers, etc. that you would like to share, please send to Madison at massie.peer@gmail.com. Please be sure to identify both horse and human in pictures and videos and give a brief explanation of what's going on in the picture. Saturday December 9: 9:00 am clinic start. 5:15 Meet and Greet at Willowcreek. Chairs will be provided. Please, No Dogs at the Clinic. Pricing Update: Pre-Registration is now CLOSED. The Lunches have already been ordered. You can pay at the door with a check or via PayPal. Credit Cards will not be accepted. For KCDS members, it is $20 per day or $40 for the weekend. For non-members, it is $35 per day, $70 for the weekend. Go to PayPal, send money to kcdsinfo@gmail.com, include Note with payment that it is for the Ali Clinic. Please do not mail any additional checks. You can pay at the door with a check. Credit Cards will not be accepted at the door. You can become a member by clicking the "Become a Member" at the top of the page. Applications will be available at the door. On Saturday, beginning at 5:15 Allison will participate in a Meet and Greet with attendees at Willowcreek. If you are not auditing, but would like to attend the Meet and Greet, it is $10 at the door. Light Refreshments will be served. Meet and Greet is included in the audit fee. More information will be shared when available here, under the News/Events tab above and on the KCDS Facebook page. The location change was necessitated by an outbreak of equine influenza at Saddle & Sirloin. There is no need to be alarmed, Saddle & Sirloin is addressing all issues. Out of an abundance of caution for the health of horses participating in the clinic, we have moved it to Willowcreek. The dates at times remain the same and we will work to accommodate all auditors. Please check back here and your email for updates and information. Saturday December 9: 9:00 am clinic start. 5:00 Meet and Greet at Willowcreek. Pricing Update: For KCDS Members it is $35 for the weekend. Box lunches are also available both days for $10 per day. You can use PayPal to pay (remember to add the price of your lunches!). Go to PayPal, send money to kcdsinfo@gmail.com, include Note with payment that it is for the Ali Clinic. Or you can mail checks to Kindra Wilson at 11205 W. 165th St., Overland Park, KS. 66221. Or you can pay at the door with a check. Credit Cards will not be accepted at the door. You can become a member by clicking the "Become a Member" at the top of the page. Applications will be available at the door. On Saturday, from 5:00 - 6:30 Allison will participate in a Meet and Greet with attendees at Willowcreek. More information will be shared when available here, under the News/Events tab above and on the KCDS Facebook page. Sign Up and Pay for Auditing the Alison Brock Clinic Today! For KCDS Members it is $35 for the weekend. Box lunches are also available both days for $10 per day. You can use PayPal to pay (remember to add the price of your lunches!). Go to PayPal, send money to kcdsinfo@gmail.com, include Note with payment that it is for the Ali Clinic. Or you can mail checks to Kindra Wilson at 11205 W. 165th St., Overland Park, KS. 66221. Or you can pay at the door with a check. Credit Cards will not be accepted at the door. Auditors Welcome $5 per day, includes Lunch. Rides are 9:00 - 3:30 each day.